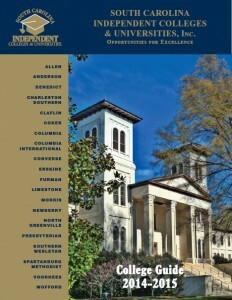 Since its launch last month, the number of visitors accessing the digital edition of the 2014 SCICU College Guide has exceeded all previous efforts. Hits in all categories have spiked in recent weeks indicating that the Guide is fast becoming the “go to” media for information about South Carolina’s independent colleges and universities. This year’s edition features walk-on actor, Jed, who introduces the Guide with a concise statement on the benefits of a liberal arts education and the cost of attendance as a real value proposition. The publication features 2-page profiles of the member colleges and universities, a list of visitation days, and detailed information on federal and state student financial assistance. To emphasize the core principles of teaching and learning on our members’ wonderfully diverse campuses, the Guide features the 20 recipients of SCICU’s 2014 Excellent in Teaching Award. In addition to hot links, page-flippers, enhanced navigation tools, and campus videos, the new digital edition is formatted for iPhones, iPads, Androids, and other Smart (HTML5) platforms-the social media world of today’s students and a growing number of their parents. SCICU is grateful for this year’s sponsors: American Student Assistance, Slice Media, and Wells Fargo.